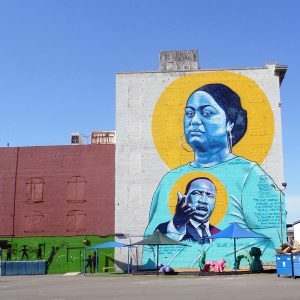 “We have a thing about doing murals in partnership with human rights and non-profit organizations,” started his story Andrew Laubie, the founder of Street Art Anarchy. SAA curates and produces high impact public art projects in such cities as New York, London, and Hong Kong. Now they have come to Downtown Stockton, CA. 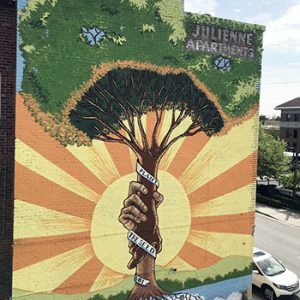 Laubie reached out to the Economic Security Project last year to suggest creating murals to illustrate the program and to inspire more awareness. ESP supports and funds projects that explore and champion unconditional cash for Americans. Soon after, ESP announced at the CASH conference in San Francisco that it would be introducing the program in Stockton, CA. In due time, Stockton’s Mayor, Michael Tubbs, rolled out SEED, Stockton Economic Empowerment Demonstration. This experimental program aims to provide a group of low income residents of Stockton a guaranteed basic income to help offset the cost of their basic needs. “I was particularly inspired by the story of Stockton and the Avant Garde projects of mayor Tubbs. I went to scout Stockton to evaluate the possibility of doing the mural project there, where I met several people,” continued Laubie. One of the people he met was Matthew Amen, the director of Huddle Co-work, who helped SAA to secure walls for the murals on downtown buildings belonging to Ten Space Development. 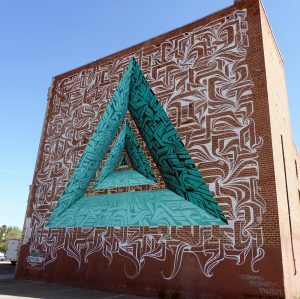 Three murals were created over the span of three weekends in Downtown Stockton. Through their creative symbolism each image ties into the philosophy of Economic Security Project and furthers the awareness of SEED in Stockton. Art by Kia; Location @ Channel St. & California St.